It was very good timing to find Ashley's new cookbook at my doorstep in December. One set of recipes in particular, from the date night inspired by "A Touch of Thai," had me dreaming of being back in Thailand. Coconut ice cream was a daily treat while we sat under umbrellas in Krabi, and I was itching for tropical flavors in the weeks after we returned. I love when recipes take you somewhere else. In this case, not only was I reminded of the fond memories of my own vacation with my husband, but I was given a glimpse into two other marriages. Before turning the pages to reveal spring rolls, green curry, and this ice cream, you read lovingly about Ashley and her husband Gabe sitting under walnut trees to celebrate her parents' fortieth wedding anniversary. And under these majestic trees, her dad asked a probing question: "What have we done in our marriage that you all have taken into your own marriages?" It's a heavy question, the kind parents feel comfortable asking once their children are grown and established and everyone starts treating each other like adults. For Ashley, the question reminded her how important small actions are, because it's in mundane moments like setting the table with cloth napkins for another date night that feelings about marriage begin to form for her children. It's a very special thing to read about, proving what we all know to be true: A meal is more than the sum of its ingredients, and food continues to be one of the intimate ways we can connect with those we love and cherish, romantic or not. In gathering the ingredients for coconut ice cream, I couldn't help but consider Paul Hostovsky's poem "Coconut." We've talked about it before, but that's the beauty of poetry: It bears repeating. Reading a good poem once is rarely enough. There are books I walk to year after year and flip open a single page of before placing it back on the shelf. Sometimes that's all you need. The words are there when I crave reminding of something long forgotten, to offer comfort, bring a smile, inspire me, offer something new. This time around, I was most interested in happiness. It's something Ashley's book nudges your towards, too, finding quiet moments in a day to spend time with the ones you care about most. It's easy to go through our week just bypassing each other, even when you live in the same house and sleep in the same bed. Quality time is what we're after, and sometimes you simply need to put it on the calendar and make an evening of it. There's a moment in the poem when the Dad says "we can't have it" because he isn't happy, so he projects that onto his son. His son starts to cry because his happiness was squashed under the fluorescent lights of the produce aisle. It took only a second, but when we are not living from a place of happiness, and our hearts are not open to it on a moment-by-moment basis, we hurt the people we love, rather unintentionally, but it changes our experience of the moment. You see, we are back to the moments that seem utterly unimportant, yet have such a profound impact. It's not unlike eating ice cream. A scoop can be devoured in minutes, without pause, without so much as a smile if you're really concentrating, but that would be missing the point, something Ashley articulates so beautifully. In this recipe you'll find the spices are warming but not overpowering. I made a few tweaks to accommodate what my pantry offered, and have to say, this recipe a complete winner. 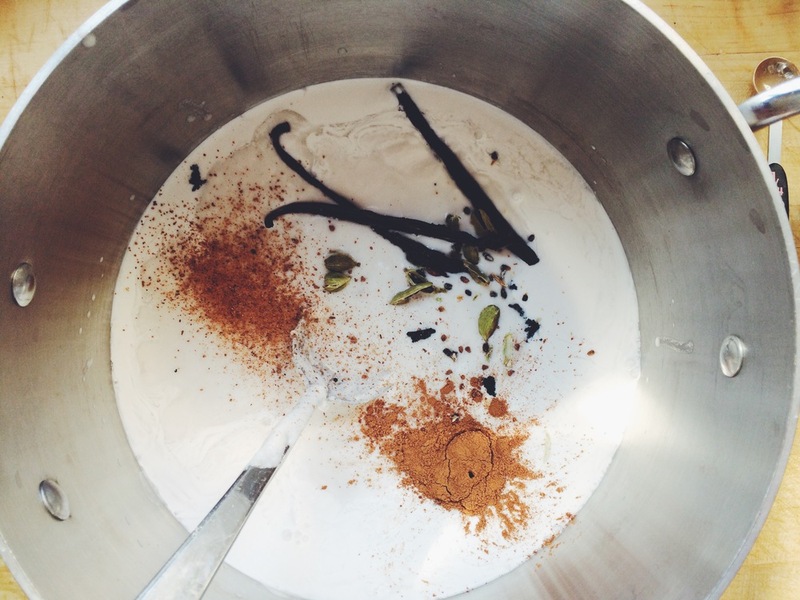 Combine the coconut milk, coconut cream, vanilla seeds and the pod, cinnamon, cardamom, and nutmeg in a medium saucepan. Bring to a simmer, then turn off the heat, cover, and let stand for 15 minutes for the flavors to infuse. In a medium bowl, whisk the egg yolks, sugar, and salt for two minutes, until pale yellow. Return the liquid to a simmer and pour a ladle-full into the eggs, whisking briskly to temper it, then pour the eggs and sugar mixture into the custard, whisking continuously until incorporated. Cook over medium heat until it has thickened enough to coat the back of a spoon, about 3 minutes. Strain the custard into a large bowl and cool to room temperature before freezing in an ice cream maker according to the manufacturers instructions. One of the benefits of coming home with a box of coconut flakes is the inevitable quest to find new ways to use it. Coconut hasn't always been in my repertoire. In fact, it's quite a new addition. I suppose blame can be placed on the beautiful island of Maui, where I had enough coconut to realize that my childhood aversion no longer ruled my taste buds. 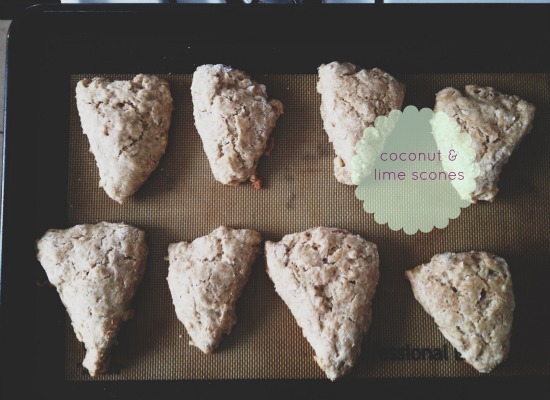 Since then, I've made Luisa's coconut banana bread more times than I can count, added coconut to tropical smoothies, and now, I've made scones. I make no secret of my love of scones. One of my favorite ways to indulge is with a proper scone, Devonshire cream, and jam, but it's also the ritual of tea that I adore so much. Wherever you are, tea forces you to slow down. It resets your mind. I drink it all morning at work (only made possible by the mug warmer I can't live without), and in the afternoon when I'm working from home. If I'm not in the mood for coffee on the weekends, I'll brew tea while my husband grinds coffee beans. When I need to write, I make tea. Tea is a trigger. It tells my mind that it's time to work, to be creative, and to accomplish something. Poetry is a trigger, too. You can't read poetry without really reading it. You can't scan poetry like a magazine article or an online newspaper. Do that, and you're bound to miss something incredibly important.